Archbishop Charles Chaput responds to questions from reporters at a press conference May 4 where he announced his decisions on eight priests who had been suspended due to past allegations of clerical misconduct or child sexual abuse. After intensive review, eight of the 26 cases of priests placed on leave last year by Cardinal Justin Rigali following the 2011 Philadelphia grand jury report have been resolved, Archbishop Charles Chaput announced at a May 4 press conference held at the Archdiocesan Pastoral Center. All eight priests had allegations against them of sexual abuse of minors or violations of the Archdiocese’s Standards of Ministerial Behavior and Boundaries. The Archbishop also said a number of the remaining cases should be decided within coming weeks. “The process of reviewing these cases was designed to ensure that the decisions announced today reflect our commitment to protect children, assist victims, restore the integrity of the priesthood and provide evidence to the broader community that they can have confidence in these outcomes,” Archbishop Chaput said. Found suitable for ministry because allegations were deemed unsubstantiated were Father Philip Barr, 92; Father Michael Chapman, 56; and Msgr. Michael Flood, 72. Found unsuitable for ministry with substantiated allegations were Father George Cadwallader, 58; Msgr. Francis Feret, 75; Father Robert Povish, 47; Father John Reardon, 65; and Father Thomas Rooney, 61. In the case of a ninth priest, Father Daniel Hoy, 89, no conclusion was reached because he died last July before an investigation could be conducted. The task of investigating past allegations of sexual misconduct is complex and time-consuming, Archbishop Chaput noted. The archdiocesan process, in the case of the 26 priests, utilizes the work of two distinct groups before a determination is made, and these groups include doctors, former police officers, former prosecutors, victims’ advocates and others with experience in the broad societal problem of sexual abuse of minors. The process began when an allegation or allegations were reported to the civil authorities for possible prosecution. The archdiocesan investigation did not begin until the local district attorney confirmed that the allegation or allegations were past the statute of limitations. They were then referred to a seven-member multi-disciplinary team formed specifically for this task and headed by Gina Maisto Smith, a former child abuse prosecutor. All the members have expertise in the field. The team does not include any archdiocesan officials or attorneys who represent the Archdiocese. After the team has thoroughly examined the cases its findings are reported to the Archbishop, who then refers the findings to the older and larger Archdiocesan Review Board. That panel has a broader constituency than Smith’s team and will continue to function even after the present 26 cases have been decided. It is only after the Archbishop receives the recommendation of the Review Board that he makes his final decision. Archbishop Chaput met with each of the eight priests whose cases have been decided in the days preceding the announcement, to inform them of their status. Although Father Barr was already retired, no decision has been made at this point on where priests cleared for ministry will be assigned; either to their last parish or elsewhere. The Archbishop said the preference of the priest and the desire of the parishioners will be part of the decision. Those who were deemed unsuitable for ministry will never receive an assignment in the Philadelphia Archdiocese or elsewhere, Archbishop Chaput emphasized. They have the right to appeal the decision to the Holy See. Depending upon the substantiated allegation, if they do not appeal or if the appeal is unsuccessful, they could be laicized (removed from the clerical state), live under permanent supervision or live a life of prayer and penance. As Archbishop Chaput explained, most of the remaining cases of the 26 are well along in the review process. Some have already received a recommendation from the multi-disciplinary team and are awaiting a final recommendation from the Review Board, after which Archbishop Chaput will make the final decision. However, six cases have not yet been cleared by the law enforcement authorities and will not be reviewed until this clearance is received. For this reason Archbishop Caput declined to give a timeline as to when the process will be completed because of the many factors involved. Specific complaints against any of the priests were not revealed at the press conference. In his remarks, Archbishop Chaput listed some of the other steps that have been taken to improve the archdiocesan response to the child abuse scandal. “Last year, the Archdiocese removed the investigative function from our victim assistance program,” he said. “We created a separate Office for Investigations and appointed Mr. Al Toczydlowski, former Philadelphia Deputy District Attorney, as its head to ensure immediate referral to law enforcement, to ensure cooperation with county district attorney’s offices and thorough investigation so that thorough investigations can be part of the canonical process. This office uses a trained forensic interviewer to take victim statements in an effort to reduce any potential re-victimization. Another component discussed and equally important is the restoration of trust, in the parishes, not only those where a priest has been accused of misconduct but all parishes, because the scandal has touched all Catholics in the Archdiocese. Toward this end a far-reaching program titled “Honesty, Healing and Hope in Christ: Confronting Sexual Violence in the Archdiocese” has been prepared, with Mary Achilles as the parish restoration project coordinator. Both Achilles and Smith gave presentations at the press conference. 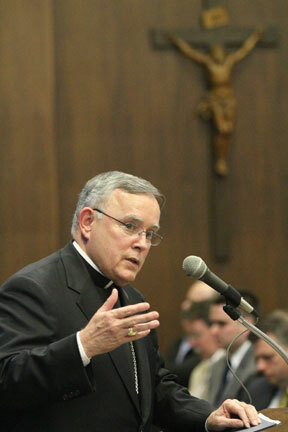 In his concluding remarks, Archbishop Chaput said, “Catholics have struggled with confusion and anger. When a child is harmed, the Church has failed. When trust is lost, the Church has failed. When the whole community suffers as a result, the Church has failed. I meant Cardinal Rigali not Archbishop Rigali. If our archdiocesan leadership were genuinely concerned about the victims, their families and their pain over these many years, then there would not be a criminal trial proceeding in downtown Philadelphia in 2012 against three archdiocesan clergy. When will those who lead us in faith finally realize that “silence” does in fact compound the pain and suffering? What did Archbishop Rigali mean when he assured all of the faithful that there were no priests then in active ministry which had credible accusations made against them ??? That was some press conference……orchestration, control and perfection.